News in the second half of the 20th century and first decade of the 21st has been filled with international crises, financial meltdowns, disasters and tragedies. None of them has had anything to do with Barry Bernson's 47-year journalism career. Instead, Bernson has endeared himself to TV audiences in Louisville and Chicago by focusing on the "little guy" and the human comedy: the extraordinary lives of ordinary people. 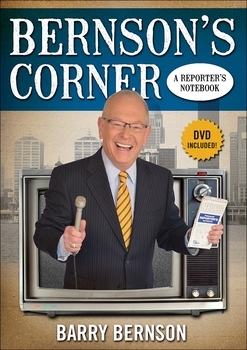 Bernson's Corner: A Reporter's Notebook is the warm, often-hilarious account of a life spent in news, from childhood mimeograph machine to satellites and the high-definition digital universe. The more the technology changes, the more Bernson remains the same: a craftsman of words and pictures, a journalist of the "old school" who believes everyone has a story worth telling. Bernson's own story reveals his half-century journey from newspapers to radio and television, finally becoming one of the most popular news anchors in his adopted home town. Along the way, you'll get a unique perspective behind the scenes of modern broadcast news: hilarious TV bloopers from the "dangerous side of the camera," a real-life "Ron Burgundy," and the fateful connection between Bernson and the father of Diane Sawyer. Also included: a DVD of Bernson's Top 10 human-interest features, covering five decades of reportage on some of the most memorable "real people" you'll ever meet: eccentrics who "swim upstream," against the rising tide of conformity. Bernson's Corner: A Reporter's Notebook offers a unique perspective on a style of journalism that has almost disappeared from the TV screen — one man's "take" on the spice of American life through all its quirks and characters.